Originally posted at The College Fix. Pressed on what the university considered a security threat, the spokesperson cited logistical hurdles. Early Tuesday morning, after a day of “heated discussions,” Gandall told The Fix in an email that the administration “backtracked” after he appeared on Prager’s radio show Monday. The club is now allowed to “stream the event and enter at 6 [p.m.], not 7,” as it requested. The Fix is awaiting the university’s confirmation of this. The club has been planning the event with Prager since November, and was under the impression that it would be able to begin seating an hour early at 6 p.m., according to Gandall. The CRs also planned on showing the State of the Union address, which was moved a week later this year because House Speaker Nancy Pelosi refused to schedule it during the government shutdown, while people filed into the venue. The university allegedly told the club that it couldn’t do this either because it hadn’t informed the police earlier, Gandall said. The university rebuffed the club again when it requested permission to seat attendees at 6 p.m., saying it would “be a threat to the university,” according to Gandall. The CRs believe the university’s bureaucratic maneuvers are aimed at sabotaging the event. He credited the university with “getting smarter” as a result of the prior work of the CRs’ lawyers at Freedom X, which has successfully represented conservative students in speech-related disputes with public colleges. Administrators “know they can’t directly stop us, so instead they have constructed a Kafkaesque bureaucracy that is impossible to navigate, similar to the IRS. This gives them the capability to nearly reinterpret the code whenever it suits them,” Gandall told The Fix. “While we might not win this battle due to these archaic regulations, we intend to directly bring the fight to the bureaucracy in the future,” he said. A university spokesperson did not initially respond to specific allegations by the CRs, including the “security threat” language attributed to the administration. 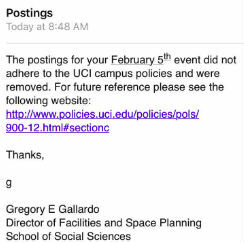 The spokesperson then referred The Fix to UCI’s policy on free speech and academic freedom. When The Fix pressed Vasich to specify the university’s security concerns, as cited by the CRs, he responded Monday that the CRs asked for the start time to be moved an hour ahead to 6 p.m.
“Logistically, that is not possible for staffing and technical set-up reasons, and the time change at this late could not be accommodated,” Vasich wrote. UPDATE: UC-Irvine spokesperson Tom Vasich responded to a second Fix query after this story was published about the university’s alleged security concerns. His response has been added. CRs leader Kimo Gandall told The Fix Tuesday morning that the administration gave in after he appeared on Dennis Prager’s radio show Monday. The Fix is awaiting confirmation from the university.